On Friday afternoon my birthday twin bestie and I dipped out of work early for mani/pedis! Afterwards I arrived home with just enough time to refresh my makeup and change for my birthday dinner before the kids got home with Matt. Ms. Jamie arrived right behind them and we promptly exited the house for our first stop of the night — drinks at Baku! Matt picked Baku for our cocktails stop because it was the location of our very first date night after we had Caroline. After a passion fruit bellini for me and a bourbon cocktail for Matt we called our uber drive back and drove .3 miles away to our final dinner destination – Dogwood Southern Table. We arrived to our dinner table where 4 of my very best friends and their hubbys were gathered and shouting “SURPRISE!” at me. I was honestly so overwhelmed. I know I say this all.the.time. but I really do have the greatest friends in the world. For the next 3 hours we sipped on cocktails, enjoyed incredible food and closed the night with one last surprise – a beautiful birthday cake! ALSO! The girls surprised me with the very, very, very, VERY best gift too — a gift card for a massage at the Ritz!! I am so spoiled!! Saturday morning all the ladies got back together for Lisa’s baby sprinkle! Afterwards I took a long nap to recover from my birthday dinner the previous night. Later that afternoon Lisa and John hosted us, Sara and Wyn over for a delicious steak dinner while the kiddos ran around and demolished popsicles.The minis were so wiped out that they crashed into bed and gifted me with the most perfect night of birthday sleep. Sunday morning we slept in until 7:50 am (THANK YOU LISA & JOHN)! 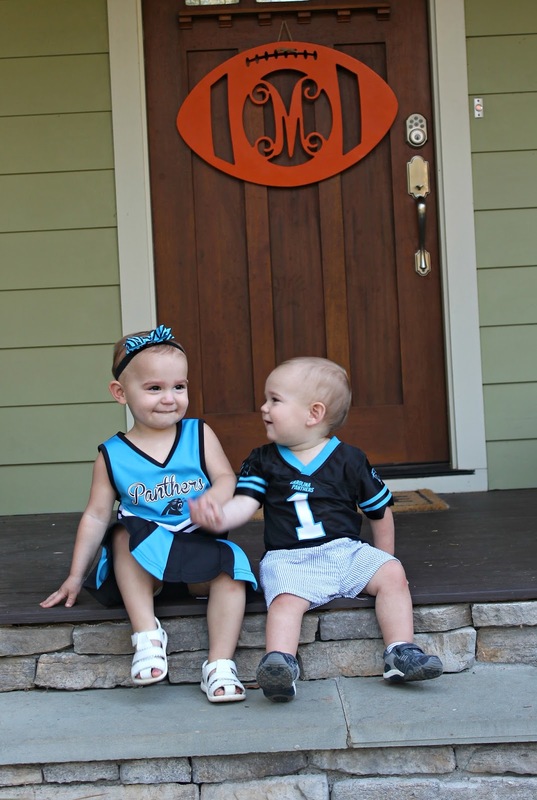 We dressed the kiddos in their Sunday football best and headed to breakfast! We went to Little Spoon Eatery for breakfast and I had the largest cup of coffee ever. The coffee cups at this place are so big that they require two hands and don’t have handles. A ginormous cup of coffee (and donuts) is pretty much my perfect way to kick off my first day in my 30’s. 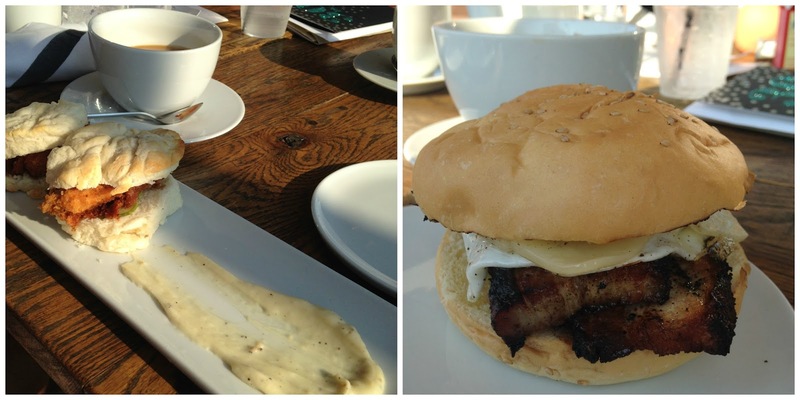 I had the most delicious pork belly bacon, egg and cheese sandwich and Matt had chicken biscuits. During breakfast the kiddos surprised me with a birthday card. And inside was a hilarious note with a gift card for a massage. They are so thoughtful. Matt wasn’t supposed to get me anything but I can never trust him at special occasions. In typical Matt fashion his card contained a super sweet message and ended with “now accept my calendar invite” which he had sent while I was reading my card. The invite was for a trip to the mountains together. THE BEST! After breakfast we made a trip to Walmart to let the kids pick out their Halloween costumes. Caroline was clearly indecisive so we bought all six costumes for her. Kidding. It was a tough call but she ultimately decided to be a bumble bee. And Thomas picked the Superman costume in about 8 seconds. The rest of the day we lounged, grocery shopped and ate cupcakes. It was pretty much the perfect 30th birthday weekend. Thank you all so much for the birthday love! Happy happy birthday!! Looks like an awesome weekend and the perfect way to start year 30!! Wishing you lots of love and happiness! What a fabulous weekend, happy birthday girl! Happy Birthday Christina! Sounds like it was a fabulous weekend! I love following along with you and your minis on the blog! Happy Monday! What an amazing 30th birthday!! You have so many great friends and family who love you! Hope you enjoy your massages and mountain weekend! What an amazing weekend of celebrations! Woohoo! Now THAT'S how you birthday! Well done Matt! Glad you had a fabulous big 3-0! Happy happy birthday! Happy birthday! What an amazing weekend you had! Happy Birthday to you!! Sounds like you had a fabulous weekend with family and friends. Happy Birthday girl! Looks like you had the weekend you deserved! I'm so glad you had a perfect weekend! Love you so much and so happy to celebrate thirty with you!!! Sounds like THE perfect weekend! Happy belated birthday! Happy belated 30th! Enjoy your 30's! I just turned 40 and learned a lot in my 30's! Best, Cari. Absolutely perfect birthday weekend! Love that Matt always has surprises up his sleeve! !